Not far from Shingwedzi there are two westerly loop drives along the S56 and S57. The S56 is the more interesting of the 2 if you really are stuck for time because it skirts the banks of the Mphongolo river for most of the way. This doesn't mean you should not do the other loop drive... it all boils down to time available. There is so much to see but sometimes you just have to make a choice. The drive to waypoint 078 is a short but lovely drive through riverine treed areas up to a viewing point where you can see the joining of the rivers Shingwedzi from the south and Mphongolo from the north. I saw a pair of Saddle Billed Storks (see image below) at the time of my visit. This bird almost always seen in pairs in one of the most striking of all birds in my view. Waypoint 077 marks the bridge across the Shingwedzi. You can get out here and so long as you stay between the yellow lines demarcating a "safe area" you can enjoy views up and down the river. This is one of the best places for an evening sunset shot. The Woolly Neck Stork is a large striking bird and it really does look like it is wearing a fleecy white woolen scarf around the whole length of its long neck. Waypoint 83 marks the turn off to make the S57 loop drive. The road like so many in the Kruger is full of curves and you NEVER know what to expect around any of these corners so it remains very advisable to drive slowly. Hitting an elephant (of which there are plenty) could be a problem for the car and its occupants too. 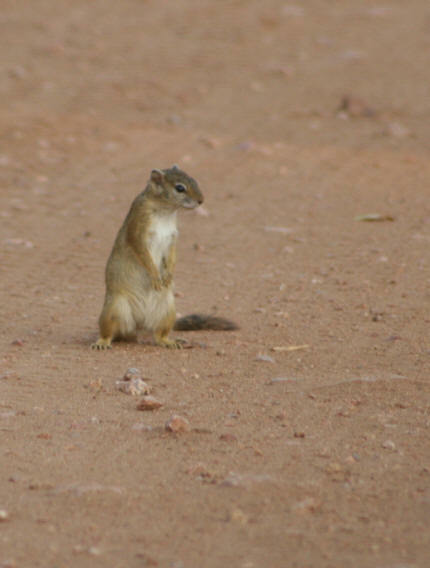 There were lots of squirrels on the drive. At waypoint 084 is the turn off to the Sirheni Bush Camp private road. 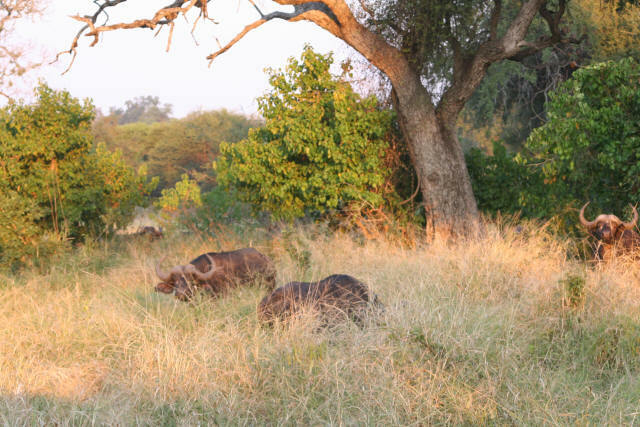 Sirheni Bush Camp nestles on the edge of the Kruger National Parks northern Mopane plains. 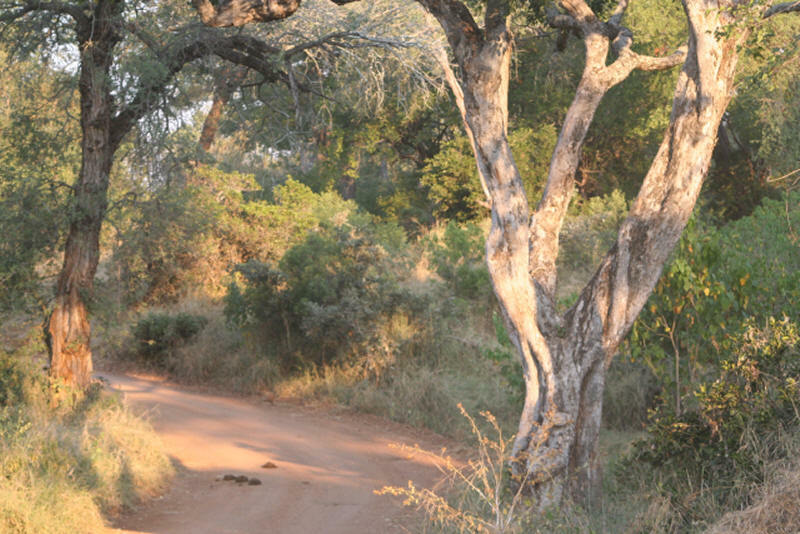 At the turn off you see dense Mopane trees on right and fairly open plains to the left. Sirheni camp is close to the banks of the Sirheni Dam, which is on the Mphongolo River. A bird hide on the perimeter fence of the camp overlooks the dam and a wide variety of wildlife and birds are attracted to dam. It's reported that there are many "visitors" to the dam. This makes it a good spot to see lions and Hyaena's. According to the SAN parks website "Sirheni has a resident leopard that is seen on a regular basis, often coming down to drink at the dam. Sirheni is a Tsonga word meaning cemetery, since the site of the camp is near a type of elephant graveyard." At waypoint 085 you'll be greeted by a dry river bed on the left with spectacular lush green banks. And at waypoint 086 on a dry river bed I saw yet another pair of Saddle Billed Storks. That made my tally 3 pairs and I have never seen more than a single pair on any previous visit to the Kruger. Waypoint 087 is the Babalala Picnic Spot where Elvis was terrorized by an elephant. You can read the full account which culminated in the elephant being shot 2 days later by clicking the link. At waypoint 084 is the turn off to the Sirheni Bush Camp private road. 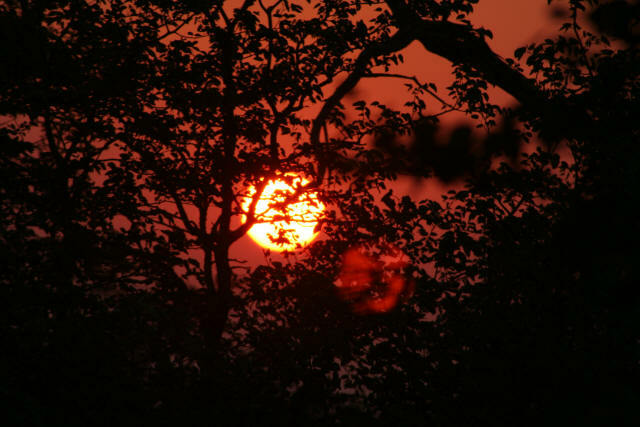 Sirheni Bush Camp nestles on the edge of the Kruger National Parks northern Mopane plains. At the turn off you see dense Mopane trees on right and fairly open plains to the left. Sirheni camp is close to the banks of the Sirheni Dam, which is on the Mphongolo River. A bird hide on the perimeter fence of the camp overlooks the dam and a wide variety of wildlife and birds are attracted to dam. It's reported that there are many at the dam. This makes it a good spot to see lions and hyaenas. According to the SAN parks website "Sirheni has a resident leopard that is seen on a regular basis, often coming down to drink at the dam. Sirheni is a Tsonga word meaning cemetery, since the site of the camp is near a type of elephant graveyard." At waypoint 085 you'll be greeted by a dry river bed on the left with spectacular lush green banks. And at waypoint 086 on a dry river bed I saw yet another pair of Saddle Billed Storks. 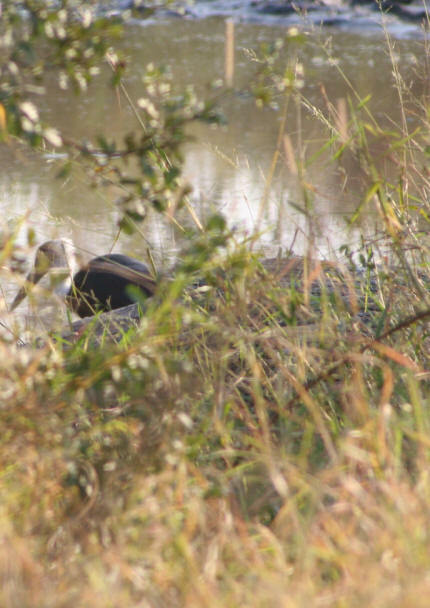 That made my tally 3 pairs and I have never seen more than a single pair on any previous visit to the Kruger. Waypoint 087 is the Babalala Picnic Spot where Elvis was terrorised by an elephant. You can read the full account which culminated in the elephant being shot 2 days later by clicking the link. Not far from Babalala on the way back down the H1-7 to Shingwedzi a large herd of Buffalo with very small calves were crossing the road. It can take quite a long time for the whole herd to wander across the road and the size of the herd can be judged by the amount of dung deposited on the road. Older bulls hold back forming a kind or rear guard protection role. 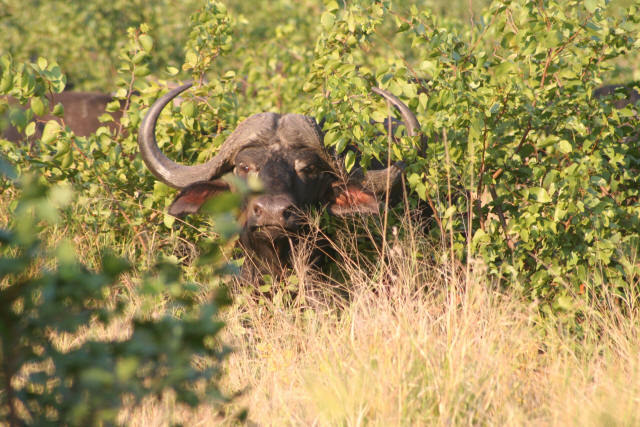 Buffalo are about the same height as the surrounding Mopane scrub and it is quite amazing how quickly and easily they blend into the Mopane. It is quite possible to be viewing a massive herd one minute to see the whole apparently disappear into Mopane scrub minutes later not to be seen again. Take a look at this buffalo shot to see what I mean. I would meet another herd of Buffalo close to the river before I reached camp and this time I got much closer. On the way back I went south via the S56 loop. What a beautiful sand road drive with lots of short stretches interspersed with many curves and made even more special by the evening light as I traveled south east. Room for 2 cars to pass quite easily or even Elephants. The Mphongolo river was on my right and I saw numerous giraffe before coming across large quantities of Buffalo dung going in my direction and sure enough after a few hundred metres there they were ... blocking the sand road. Unlike Elephant, Buffalo in this situation are fairly predictable. They will watch a while (stare actually) and then continue on their way at their own slow pace. It was getting late in the afternoon and the gates closed at 5.30 so I slowly edged up to the herd hoping to get through a gap when suddenly they bolted into the bush. It was only a short stampede but what a racket and the dust was certainly flying. It would not be too difficult to imagine the panic and energy that would go into a full flight when faced with a pride of hunting lions. Thankfully the road cleared in front of me and I could continue my way as evening drew in. The Buffalo had lots of very small calves. I took this picture shortly before I came across the buffalo described above. It is a scene I can conjure up in my mind at any time to remind me of those delightfully interesting woodland and riverine scenes of which there are so many in this paradise called Kruger. Scenes like this epitomize what the Kruger is about ... mystery and suspense combined with an infinite and indescribable natural beauty and life in so many forms.